There Are Huge Differences Between Books And Reading. You Buy Information When You Purchase A Book, But Acquire Information When You Read. Reading Is Understanding The Promises Of Life. Reading Is Escaping The Traps Of Average Living. Reading Is Refusing Existence But Embrace Living Life. Reading Is Living Under The Counsel And Covering Of Success. Reading Is The Process Of Planting The Seed Of Life Into Your Good Heart On Purpose. You Nourish The Seed By More Reading, More Reading For Watering, More Reading For Cultivating And More Reading For Harvesting. Books Profit Nothing, It Is Reading That Breeds Life. This entry was posted in The Secret, Vitamin Of The Mind, You! 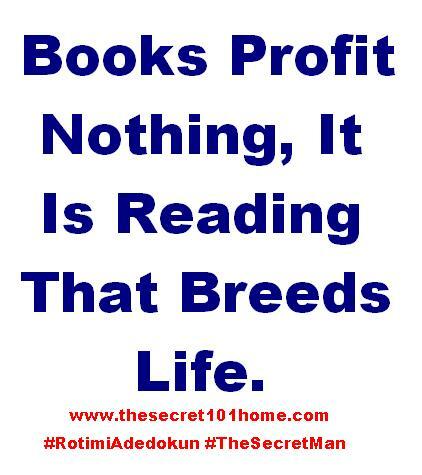 and tagged Books, How To Acquire Life Secrets, Jim Rohn, Pastor E A Adeboye On Reading, Reading, Reading Is Living, Rotimi Adedokun On Reading, The Power Of Reading By Bishop David Oyedepo, The Secret In Reading Books. Bookmark the permalink.